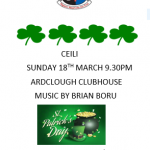 Due to the Bad weather we have unfortunately had to cancel the Ceile which was planned for tonight 18th March. We will re-schedule a date as soon as possible. Keep an eye out on our social media channels for an update.